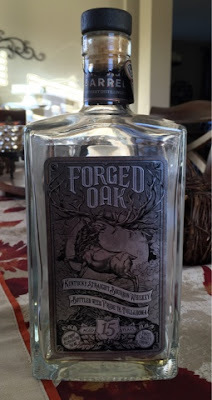 Forged Oak is the latest of the Orphan Barrel bourbons to grace my glass, and perhaps the last of what's been released to date (unless I stumble into some Rhetoric). Interestingly, it's the youngest that I've tried to date, and it is my favorite. Possibly due in large part to the younger age, this bourbon, despite its name, does not have the same wood and tannic flavors that the other Orphan Barrel releases all shared. Yet, it didn't come across as an overly sweet bourbon either. Rather, Forged Oak found a very nice place in between, and I found myself really enjoying it (perhaps too much at times). At first it came across just as a typical, drinkable bourbon, reminding me of a "chewier" Bonded Beam. Mild vanilla and walnut flavors were noticeable, with a light brown sugar sweetness. Accordingly, the first poor left me unimpressed, particularly given the price. However, after that first pour, it was a few weeks before I went back to the bottle, and when I did, I found a much different bourbon. This time around very strong vanilla and almond flavors were prominent. The bourbon had sweetened up significantly, and it reminded me of Amaretto liqueur. It didn't taste like the liqueur, though. It just reminded me of it, and I happen to like the flavor. It comes in at 90.5 proof, so it's a relatively inoffensive bourbon, and after shelving it for a couple weeks following the first pour, I then went through the bottle relatively quickly. After each glass I just wanted another. It's not that rare of a whiskey, despite the marketing efforts of Diageo to make you think otherwise. After all, this bottle was #23,951, and I'm not sure just how high those numbers go. Whether the price is justified by the juice, I'm not entirely certain. However, measuring the bourbon itself, I thought it was very good and held up well. If it weren't for the price, I could easily make this a regular pour.